LL (5 Nov 2018)- The legacy of Job’s wife is a fine story, and finely written at that…it is almost as if one is watching the movie…It is very easy to fall in love with Job. S1A (13 Nov 2018)- With her heart and soul, the author, Cynthia.J Koelker, has written an outstanding spiritual book which can be used as an inspiration. I never expected such a development from this Bible’s citation about ‘curse God and die.’ It is so far one of the best books I have read in my life. I would recommend people to add this book to their reading list! It is a must! I read this book after the unexpected loss of my beloved wife. The emptiness Job’s wife suffered as she sat alone in the silence struck a chord with me. I, too, am waiting in the silence for the intense pain to fade. I know how it is to hurt too much to talk with people who can’t really understand. When bad things happen to good people – could you survive this? 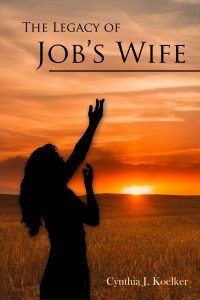 The Legacy of Job’s Wife is a fictional account, exploring the thoughts of Job’s wife, as she dealt with the tragedies of her life. The Bible has much to say about Job and God’s interactions with him, but records only 2 sentences spoken by his wife. The author weaves a multi-layered tale, describing the life of this wife, whose name is not even known in the Bible – before, during, and after the disasters that befall their family.